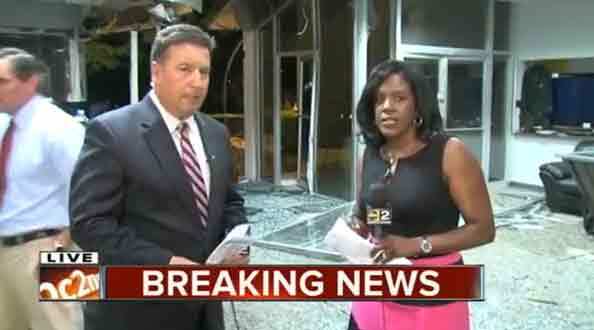 After a man claiming to be God rammed a truck into the front entrance of WMAR-TV in Baltimore, the station had to improvise on many levels, including where to anchor its own newscasts from. The station was forced off the air during the five hour ordeal because nearly all employees were evacuated, so news staffers used social media and the station’s website to cover the story. Once the suspect was arrested and the “all clear” given, the station was able to get back on the air with help from its sister station in Phoenix, but instead of originating from its normal set, the station turned its own lobby into a set of sorts. Standing anchors used handheld mics to update viewers on the situation as staffers and other people could be seen in the background evaluating the situation and cleaning up the mess.